Having a little one in 2 weeks with a 14 month old already. Could really give this a try. Thanks for the recommendation! 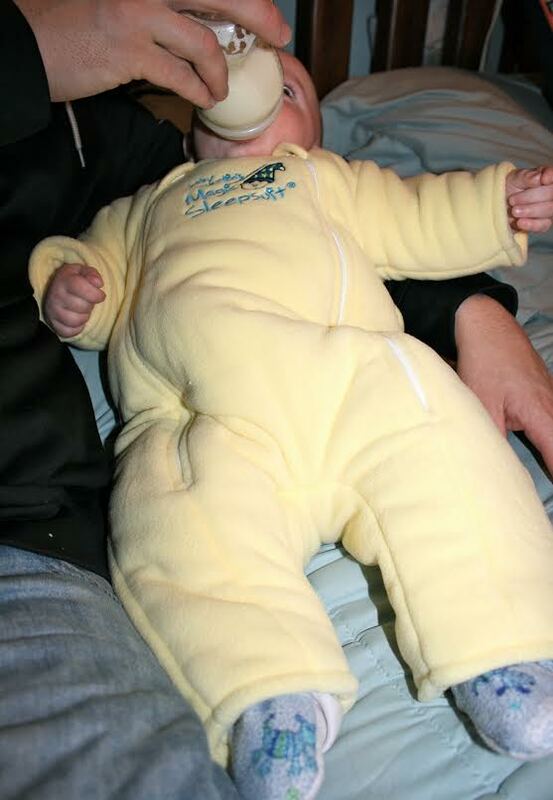 Oh man, I've heard so many great things about this sleepsuit! My tips for getting baby to sleep are...try cry it out? I swear it's the best parenting decision we made with our first buuuut we're also only on our second, so who knows what the future holds! haha. No tips....baby 6 here who is 5 months, but slept better a couple of months ago and a 2 year old who still doesn't sleep through the night 😒....does this come in toddler sizes? Our first was a breeze when it came to sleeping through the night. Our second is just eight weeks old, but things are already different. I go back to work in a couple weeks and I'm desperate! I am so happy for you that he is sleeping! Things are going well so far, because in these early weeks I like co-sleeping. Soon, however, I think I will be dying to own one of these. How have I never heard if it before?!? So happy that you feel human again! I'm hoping for that magical day again, too! What a fun giveaway!! We are expecting number four in six weeks and I am just starting to mentally review my sleep strategies! I found the feed every three hours was our biggest asset (not insanely strict) but like you said......... every baby is different. I've had this on our short list bc I've heard so much about it! Would love to try. Thank you to you both! And glad your fam is sleeping again! I am not going to enter the giveaway because I do not need this magic sleeper (though in the Catholic world I probably just jixed myself...) but I will definitely remember this review the next time I am in need! So glad it is working for Brendan and you are getting some much needed rest! HA! I was going to write the same comment! :) Why do they always come up with these awesome things just a little too late for me? He's so cute, I love that pic of him sleeping away in the crib. Sleep is so hard for me! My only go-to is nursing them back to sleep which is not really a tip! I'm having Baby #4 in a couple of months & would love one of these! I've used sound machines with my babies and that has helped some with sleep, but I don't have any great tips. Each baby can be so different! Bore them to sleep. With screens and lights and wild colors and all sorts of gadgets at the ready, I've found that making the room as boring as possible is key. No tips except mine usually finally sleep all night around 6yrs old! I would LOVE this for my little one now. I would LOVE to sleep lol. Last 2 nights were like 4hr nights..... it's been a long 18yrs with little lol. I don't have any tips as I'm still trying to figure this out myself! I'd love to try this suit! Though! My little one still isn't sleeping on her own through the night. Ugh! I hear you Mama. Our youngest was born in early August and a sleeper she is not. Help! Gus is having some kind of sleep reversion and it's making me cry. He *was* my best sleeper ever but now takes 30 minute naps. 😭 Night time sleep is a little better but he could still use some help there too. I literally got on the internet to research sleep tips and your post came up, so I know my guardian angel is watching out for me. Would love to try one for my 5 month old granddaughter-I watch her during the week and she only takes cat naps unless I hold her which I love to do but I need to get some things done. I'm sure the Baby Merlins Sleep Suit would be a wonderful substitute for an hour or two for Grandma's comfy body. I'm sure Mom & Dad would love it too! Thanks! My tip to get a baby to sleep is..well, I have a 1yo who still doesn't sleep through the night!! But, I do like to try stoking their nose as a newborn to get them to close their eyes so there's a truck! Seeing as how my almost 2 year old is still not sleeping through the night, no tips from me! But I'm having a baby next month and praying for more sleep this time around! I won't enter since I don't have a bubs to put in one, but I had to comment anyway. You are the second person I heard rave about the sleepsuit. I have a question about it..though. It says in their FAQ to transition out of it once a baby starts to roll over in their sleep. Mine is 6 months old and has been rolling over in her sleep for at least 2-3 months now. Does Brendan not roll over? We are co-sleepers so I'm not that worried about night-time sleep, but I've been really working on helping my baby take longer naps. For me the biggest tip is using white noise. That seems to help her nap longer as it drown out all the household sounds. My kids sleep well with white noise and a regular routine that we can count on. Unfortunately, it's been hard to get my 6 month old into a routine so far, and I would love to try this sleep suit on him! My sleep advice is don't let them get overtired. Mine seemed to sleep better when I put them down before they got super tired and cranky. This sounds great! Would love to try it with my 5 month old. He ends up in our bed more than I like. AMazing! I am constantly amazed at the products out there. Kolbe isn't our best sleeper either. Maybe this is what I should try next. He likes to snuggle too, but co-sleeping also means he eats way more at night than he really needs to just because I'm there. Ugh! I need them to make one to fit my 30lb 2yr old. My tip isn't really a tip... we just do what works for the kid. For Felicity, it was nursing. For Clare, it's rocking. I follow the path of least resistance lol! No tips :( I have a 2 month old who has superpowers and hardly sleeps. Try using white noise..some babies like it. We are tearing our hair out with two neither of whom sleep well. 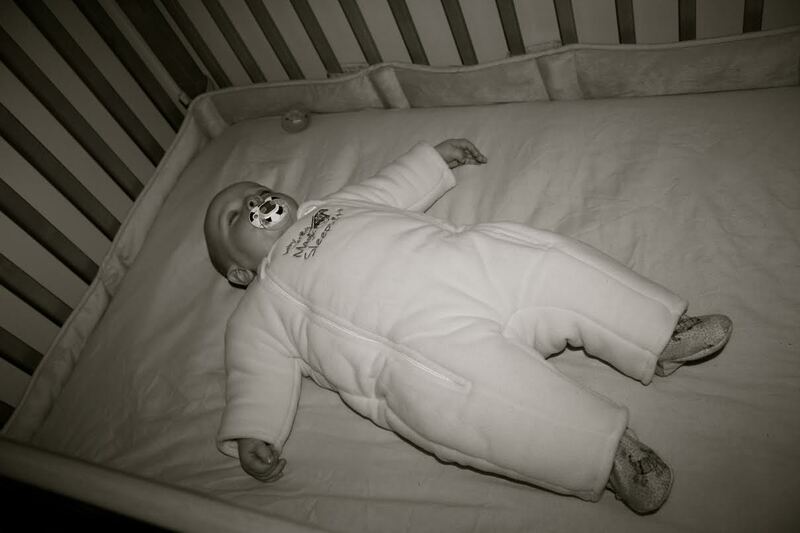 White noise, nursing, swaddling, rocking, comfort object, all have been tried. The rock n play has been awesome for the newborn stage. I rock mine to sleep. I've heard good things about the merlin sleep suit! I would love to win this for my SIL expecting her 2nd little baby. I've also been blessed with great sleepers until recently then we tried liquid melotonin and it has greatly helped out. Also turning off all tvs, iPads, kindles, and what not about 2 hours before bed has helped as well. The only sleeping trick that worked consistently for my four boys was co-sleeping. Now that I am pregnant with my fifth child, I would love to find something else that works!